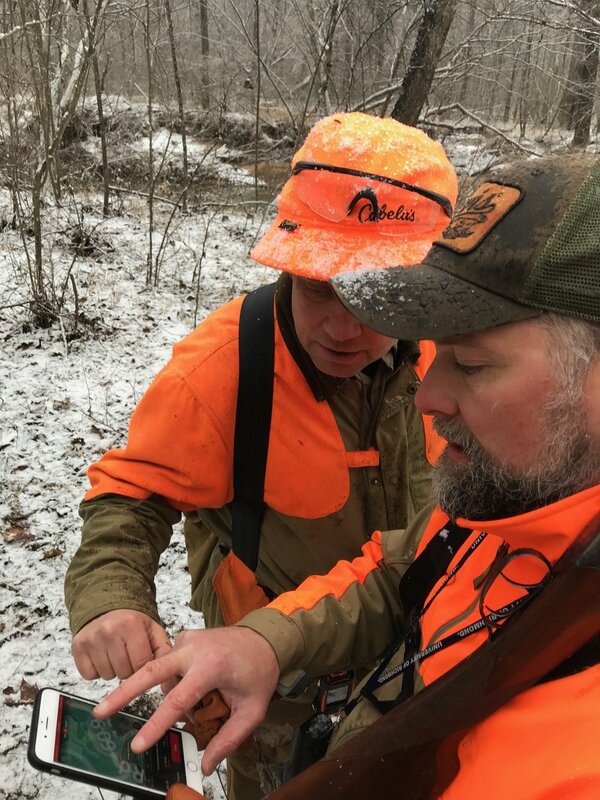 By way of after-report, Lincoln and I wrapped up our American woodcock season yesterday (the season ends January 14 in Virginia). I couldn’t think of a more ideal end to the first wild bird season to expire this year (grouse and quail remain), and it’s worth briefly chronicling the major episodes in this magical weekend. Justin, Lincoln, and I first scouted the areas we’d identified for further exploration. Justin and I hiked about five or six miles and Lincoln logged about nineteen miles with a lot of excited meandering, nose to the ground. We marked the areas on the map where we found Woodcock splash (droppings) and Lincoln flushed up a couple. We were too far away to see if he pointed them or not, but could my imagination be playing tricks on me? Did I hear his bell quiet just before each of the flushes? At any rate, the timberdoodle light bulb seemed to be coming on for Lincoln. Neither Justin nor I stumbled across/flushed any and the fact that Lincoln did seemed to indicate that he was in fact finding them using his nose and not just randomly scaring them up as he hopped over logs and ducked under branches. I looked back at Lincoln, directly facing Kona and the bird holding tight, and thought about what a perfect set up this was for him. I crept up on the bird, my left hand in ready position under my gun’s forearm, my right thumb clicking off the safety and my trigger finger at the ready. The bird exploded from the floor and made a straight shot for the clearing in front of us, beautiful open sky behind it. I heard the shot ring out seemingly a split second before I realized it was mine and the bird folded and hit the ground. I released Lincoln as Chip called for Kona to retrieve, and soon the bird was in Chip’s hand, passing it off to me. We were now two for two. Could the day possibly get any better? We decided to push on and find out. We started to loop back toward the trucks, deciding that if we had another point, we’d continue a little while longer, otherwise, we’d load up and make our way to the other scouted location. As we approached the final hundred yards of the path back we paused for a photo op to document the crazy good luck we’d had in finding only a couple of stragglers but connecting on both. We loaded up and headed to the next scouted location, about a forty minute drive from the first. On the way, it started to snow, which I couldn’t help but think was befitting this magical first full season for me and Lincoln. We’d had luck, Lincoln had received a master class in woodcock finding and pointing under the tutelage of Kona, and if all the rest of the day held in store for us was a walk through gorgeous scenery in the snow, then it would have been a perfect coda on the day, but some luck and lessons remained. We pulled into the second parking spot and hiked straight to the area we’d scouted. We hadn’t walked through that covert for more than five minutes before a bird exploded and gave the third among us a beautiful, open shot. Justin connected high and to our right, and, as the bird fell, he and I (both new to wild bird hunting this year) realized only then that the river we were roughly following laid under the bird at point of contact. We watched the bird continue its fall on the far bank, out of sight of our dogs. None of the dogs have been trained on water retrieves and the depth of the river, the tangled mess of trees both in the water and in the spot where the bird fell, and the cold temperatures made a first try for any of them on a water retrieve a foolhardy move. But Justin is a West Virginia mountain boy, an experienced deer and bear hunter, and has had to navigate much worse in retrieving and packing out his game. I’m proud to regularly hunt with both of the guys with me yesterday, both sportsmen and both of whom take seriously our obligation to our prey. 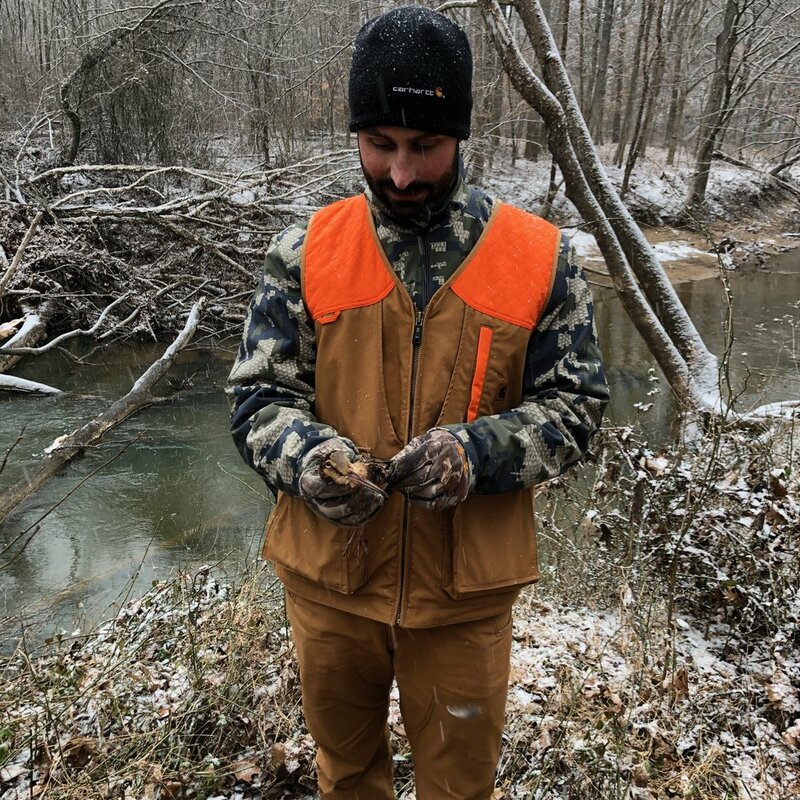 There was just no question in Justin’s mind that since he had shot that bird, he was going to ensure it wasn’t just abandoned on the far bank, not knowing whether it was dead or crippled. Either way, he certainly wasn’t going to let it go to waste without a serious attempt to retrieve it, despite a precarious route to success. Justin commencing his West Virginia mountain boy circus act, all to ensure he didn’t willingly surrender a retrieve on a downed bird. Justin with a hard earned bird. 2018-2019 American woodcock season twilight creeping in on the three musketeers, Justin, Chip, and Robb, their harvest, Nova (left), and the canine star of the day, Kona (right). As we drove home yesterday evening over snowy roads on our last day of woodcock season, looking forward to a little time remaining for grouse and quail, I couldn’t help but feel a swell of hope. Lincoln was coming along just like so many assured me he would. Much more importantly, I know for certain that Heather and I couldn't have found as lovable, talented, clownish, and affectionate dog nor a dog we could love more than we love Lincoln. I couldn’t have had a better nor more generous first mentor and friend on our journey than Chip. I have to remind myself I cold-called the guy less than two years ago. It feels like I’ve known him for so much longer. I couldn’t have found a better friend to join up with me to learn to bird hunt than Justin. Even if I could have found another pursuit that Lincoln and I would both enjoy, I am so grateful for the fact that I’ve found this one in that it seems the thing that gives both of us the most joy learning together. We are a man and bird dog truly fortunate in each other and the friends who’ve joined us, mentored us, encouraged us, and challenged us. And this first year’s woodcock seem a sign: we’ve been blessed by good fortune with just enough success to keep us engaged and growing, never discouraged to the point of despair, but not so much to spoil us from appreciating all that this wondrous pursuit has to teach us and have us experience together. I can think of nothing I’d hope more from the rest of this year together or the years to come. May it be so.